That line sticks out of the new Flogging Molly’s The Hand of John L Sullivan. Name sound familiar? Sullivan, nicknamed “Boston Strong Boy”, is otherwise known as the strongman meme. We here at Official Man Card have a strong connection with Mr. Sullivan, including using a likeness to display as a pinnacle of Man Card worthy Man. 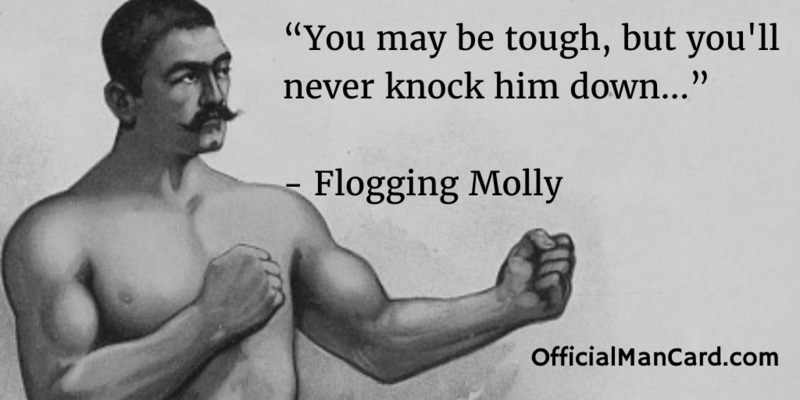 Flogging Molly, an Irish-punk band based out of LA, have displayed a similar love for ol’ John with their new hit The Hand of John L Sullivan, which you can hear below. What’s in a hand? Sullivan not only was a world class boxer, but also the working-class hero of the century. Men of the era looked to Sullivan as their poster-boy and a representation that you could be anything if you put enough working-class hard work into it. To shake the hand of John L. Sullivan represented leaving struggles behind and to give hope. We can’t think of something that is more Man Card worthy. Enjoy the song and let us know what you think in the comments below.